Both AMD and Intel have product lines catered to the commercial market: large scale business deployments that require stability and administration-at-a-distance across tens of thousands of units. Imagine a company like Pepsico investing in a computing infrastructure that requires its US staff to all have a company laptop: not only is it a big operation, but it has big requirements for manageability and performance. This is what the commercial computing market is all about. This is not to be confused with the embedded market, which has different requirements. 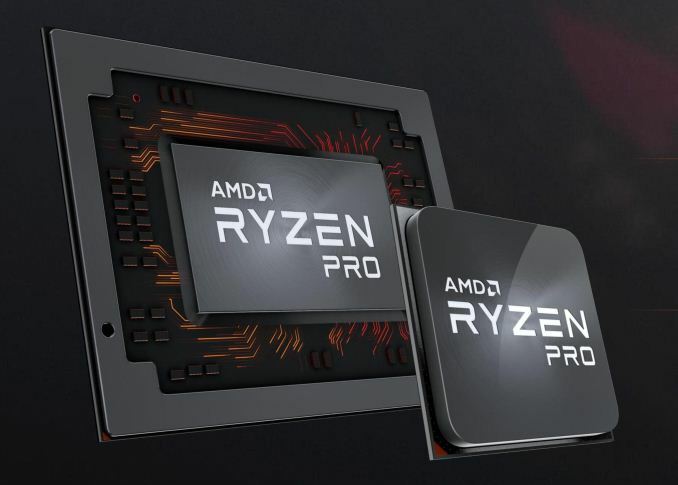 AMD’s ‘Pro’ platforms are the equivalent to Intel’s ‘vPro’ platforms, and AMD has provided Pro level processors for over a decade. In that time we have seen Kaveri Pro and Carrizo Pro processors announced for large scale deployments, with AMD reinforcing these platforms with long stable image support for software (18 months), guaranteed processor availability (24 months), longer term warranty (36 months), and an open source CPU agnostic management platform (DASH) so customers are not locked into a proprietary ecosystem. AMD’s latest push of its Pro ecosystem is with its new high-performance x86 Zen cores and Radeon Vega graphics. There are three mobile parts for commercial-grade notebooks, and four desktop parts for commercial-grade laptops. These models follow the consumer grade hardware and are identical in core counts, frequencies, and capabilities, but come with the updated support as listed above along with a guarantee that these parts use some of the best silicon from the production line. Memory support is also identical to the consumer parts. Ryzen Pro for Mobile has three APUs, one each for Ryzen 7, Ryzen 5, and Ryzen 3. All three have a 15W nominal TDP which can be adjusted from 12W to 25W depending on the design of the chassis and performance required. Ryzen Pro for Desktop has four APUs, mirroring the APUs on the consumer platform with two at 65W and two at 35W. These components use the same AM4 socket as well, however they will not be sold at retail. AMD lists the benefits of these parts similarly to the consumer grade components however a lot of them will actually be used in the commercial space: transparent secure memory encryption (SME), secure boot (hardware-based), application whitelist, fTPM and TPM 2.0 support, and KVM support through DASH. 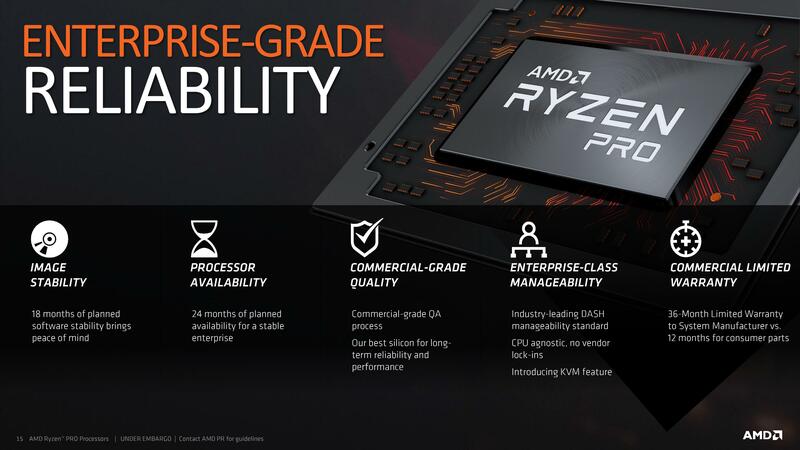 Also, AMD likes to promote that they offer a Ryzen 3 grade Pro processor for the lower performance segment, whereas the competition start at Core i5. While not to blow AMD’s trumpet, one of the important aspects to these commercial systems is deployment. 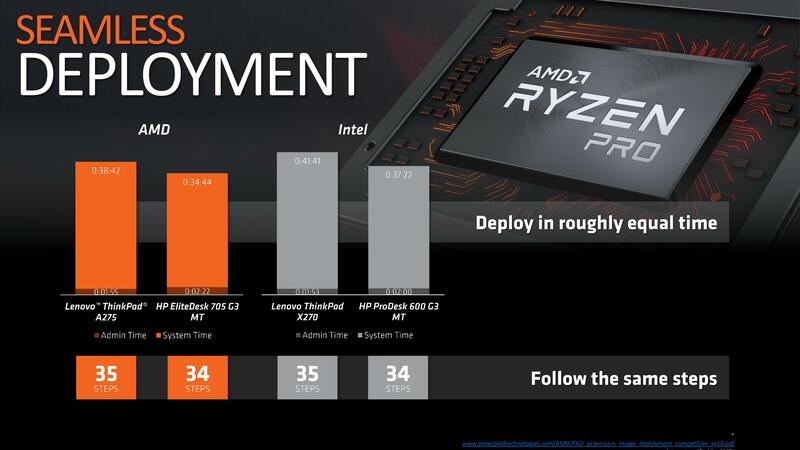 In AMD’s presentation to the press, they compared the required admin time, system time, and steps to deployment, between vPro and Ryzen Pro systems. The results were identical if not slightly better: an AMD-based Lenovo Thinkpad taking 35 steps and around 40 minutes, with the Intel-based Lenovo Thinkpad also taking 35 steps and about 43 minutes. 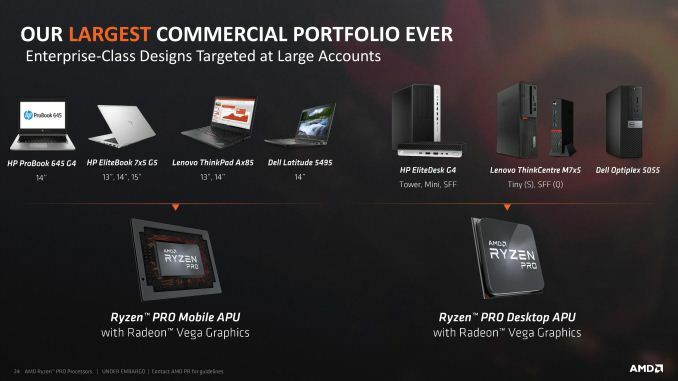 AMD also stated the opportunities in the commercial segment for them. 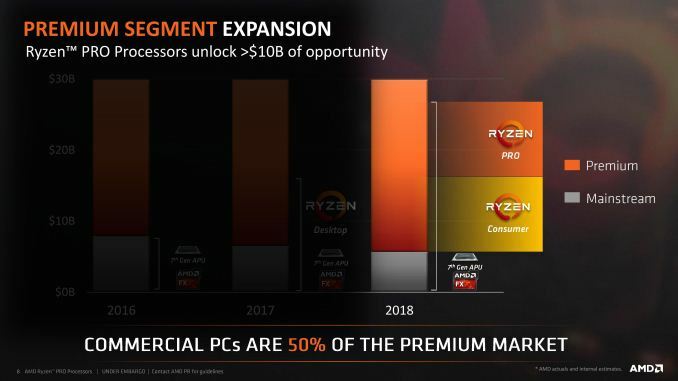 Most online technology websites focus on the consumer platforms, but AMD stated in our presentation that out of the premium segment of computing, out of a potential $30 billion total addressable market (TAM), around $10b of that is purely for commercial products, and they hope that Ryzen Pro can very easily fit the bill. To compare to the consumer segment, AMD listed this as also around $10b, making the standard CPUs that go into commercial systems just as important as the Ryzen 7 2700X or latest Threadripper for revenue. The thing here is, while the Pro APUs are lower cost, they are sold in 1000s of units to laptop companies with contracts with major businesses. It is a lot about volume. The major partners for AMD’s Ryzen Pro line are the usual names: HP, Lenovo, and Dell. On the Ryzen Pro for Mobile, AMD is in the HP ProBook 645 G4, the HP Elitebook 7x5 line, the Lenovo Thinkpad Ax85 models, and the Dell Latitude 5495. The Ryzen Pro for Desktop processors are in HP’s EliteDesk G4 mini-towers, the Lenovo ThinkCentre M7x5 family, Dell’s Optiplex 5055, and HP’s 285 desktops. A number of systems have already been announced, such as those from HP. AMD wasn't too keen on opening up most of the security and management technologies they use in their CPUs. "three mobile parts for commercial-grade notebooks, and four desktop parts for commercial-grade laptops." I hope what was written is a typo! If not, are we really using notebook/laptop to mean different things in a way that is supposed to be meaningful to a reader and used consistently across the industry?